New Delhi: Tata Consultancy Services Ltd’s (TCS) market cap surged past the Rs7 trillion mark on Friday, making it the first company to achieve this milestone. Buoyed by a rally in its share price, TCS’s market cap jumped to Rs703,309 crore in intraday trading on the BSE. The market cap has been calculated from its 52-week high price of Rs3,674 hit Friday on the exchange. TCS share price rose by 1.91% to Rs3,674 on Friday. Shares of the company have gained nearly 35% so far this year. 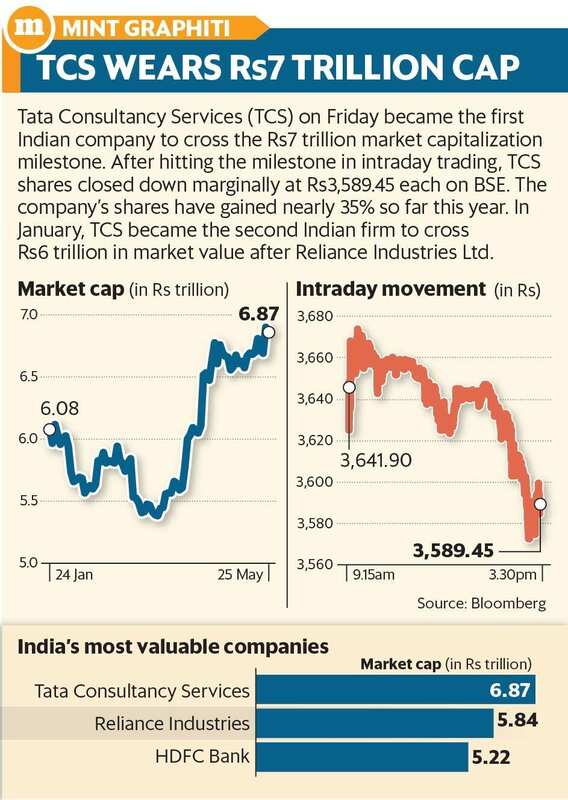 TCS market cap had earlier this year surged past the Rs6 trillion mark, making it the second company to achieve the milestone after Reliance Industries Ltd (RIL). The IT bellwether had last month became the first Indian company to close the trading session with over $100 billion market cap. TCS is the most valued company in India, followed by RIL with a market cap of Rs583,908.87 crore, HDFC Bank (Rs519,654.83 crore), Hindustan Unilever Ltd (Rs342,244.47 crore) and ITC Ltd (Rs330,919.46 crore) in the top-five list. The nation’s largest software exporter TCS on 19 April reported a 4.4% rise in March quarter net profit at Rs6,904 crore.